These days Jamaican rums which were previously and mostly blending fodder are getting not only a new lease on life but a resurgence of their reputation that is so massive and enthusiast-driven that it’s led to the re-emergence of names like Longpond, Worthy Park, Clarendon, Inswood, Monymusk, New Yarmouth, Hampden Estate (and others), that might be giving Appleton some sleepless nights. Lovers of the style can’t seem to get enough of them, which goes a long way to demonstrating public boredom with pallid blended meh-rums that have suffused much of the consuming landscape for the last decades. People were and are simply looking for something more exciting, more distinctive…and Jamaicans are filling that niche very nicely indeed. 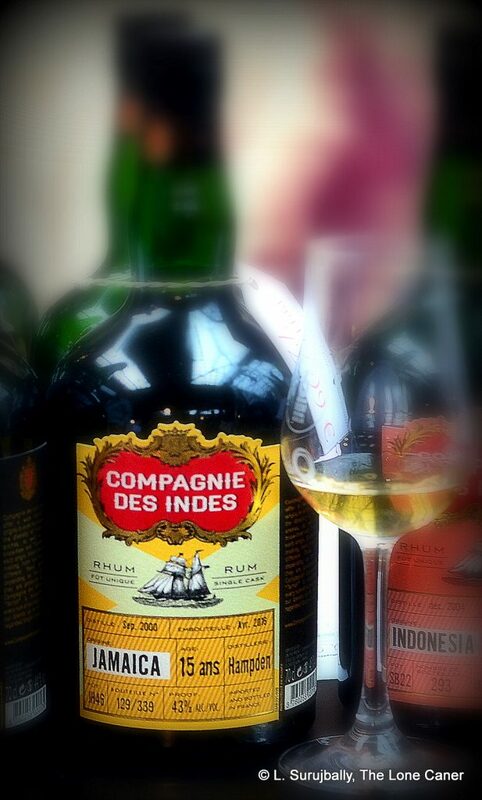 In 2017 the French company Compagnie des Indes issued a New Yarmouth rum which excited raves across the Jamaican rum loving cognoscenti (I have yet to try it myself), and in 2018 Velier issued two Hampdens themselves – both lit up Facebook like the Fourth of July. And that’s not even counting the other Worthy Park and Hampdens which have come to market in the last few years. The Hampden I’m looking at today is a bit more modest, however – it is one Compagnie edition of about twenty from the island that were released up to 2017 (of which four were from Hampden). In terms of background, it’s a 43% rum, pot still origin, barrel #JH46, distiilled in 2000 and bottled in 2016, 339 bottles, sourced in Europe (probably Scheer) – and if you’re really interested I dragged some others from the island to act as controls: the Mexan XO, the Mezan WP 2005, another two Compagnie rums – the Longpond 12 YO (44%) and the Worthy Park 7 YO (53%). Because I was curious how well the Hampden would fare against both other estates, and other strengths. There was no mistaking the lemon-yellow Hampden for anything but a Jamaican, that was for sure. The nose was slightly sweeter than the Mezans and the CdI Longpond, very clear, redolent of cherries, tart fruits, green apples, rotting banana funk, overripe mangoes, together with a fine line of citrus carving through the whole thing – a medium ester rum, I hazarded, and very crisp and clean to smell. On the palate, I didn’t think it could quite beat out the CdI Worthy Park (which was half its age, though quite a bit stronger); but it definitely had more force and more uniqueness in the way it developed than the Longpond and the Mezans. It started with cherries, going-off bananas mixed with a delicious citrus backbone, not too excessive. After ten minutes or so it opened further into a medium sweet set of fruits (peaches, pears, apples), and showed notes of oak, cinnamon, some brininess, green grapes, all backed up by delicate florals that were very aromatic and provided a good background for the finish. That in turn glided along to a relatively serene, slightly heated medium-long stop with just a few bounces on the road to its eventual disappearance, though with little more than what the palate had already demonstrated. Fruitiness and some citrus and cinnamon was about it. 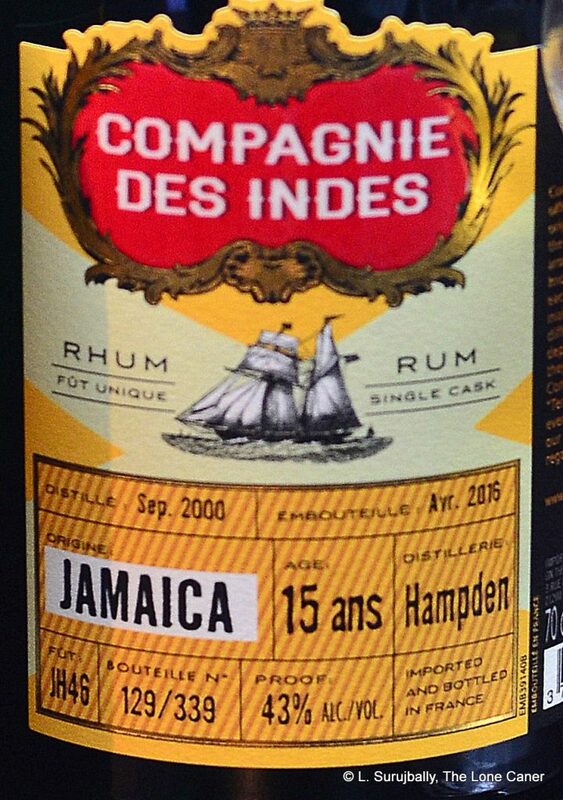 Overall, a solid, tasty Jamaican rum, presenting somewhat younger than its physical years. It was continentally aged, so the rich voluptuousness of a tropically-aged rum was not its forte. Some of its rough edges were sanded away while leaving enough to give it some character: its strength was right, I think, and it lacked some of the furious brutality of younger ester bombs from the estates, without losing any of its elemental character. Not all high-ester, funk-driven, dunder-squirting rums are meant for such neat sipping (as has been remarked on before, such intensely flavoured Jamaicans are often used as flavouring agents in other blended rums). But as a rum by itself, tasted and evaluated on its own, this fifteen year old is a very pleasant sipping dram that retains just enough edge to make it a very good experience to have by itself, or to perk up whatever cocktail you feel like adding it to. For a pretty good historical and production-level rundown on Hampden estate, the Cocktail Wonk’s 2016 article covers just abut everything.